5 WhatsApp Security Tips: WhatsApp recently announced that it has more than 700 million monthly active members, which sends around 30 billion messages a month. That’s an enormous volume of personal information being communicated, and even though WhatsApp now encrypts all of its messages and data, it pays to be secure with your chats. 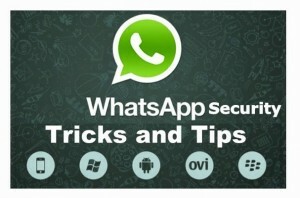 One of the best WhatsApp security tips is to protect the app with a password or PIN. WhatsApp itself doesn’t offer such a function, but there are third-party apps that do. It might seem cumbersome but if you lose your phone, it’s going to prevent anyone else accessing your chats. It’s fair to assume that your WhatsApp conversations might occasionally take on a distinctly ‘personal’ note. If you’re sharing images with your significant other, the last thing you want is for those images to appear in your general photostream, popping up when you let a friend swipe through your holiday snaps. Go into your phone’s Settings menu, then ‘Privacy’, ‘Photos’, and deselect WhatsApp from the list of apps whose images are fed into the photostream. Android users will have to get under the hood a little bit. Using a file explorer app like ES File Explorer, find WhatsApp’s ‘Images’ and ‘Videos’ folders. Create a file within each called ‘.nomedia‘. That will stop Android’s Gallery from scanning the folder. Secondly, if you exclude WhatsApp images from your photoroll, and lock the app as above, it provides another layer of security if your phone is stolen or hacked into – but it won’t be a 100 per cent bulletproof solution. Is your profile photo one you’ve used elsewhere – on LinkedIn, Facebook or Twitter? Maybe it’s even on your company’s website somewhere. If it is, and your WhatsApp sharing is public, anyone you’ve ever spoken to – even if you’ve just replied to an unwanted message – can download your pic from your WhatsApp profile and, using Google Image search, very quickly find out more about you. Set profile picture sharing to “contacts only” in the Privacy menu. WhatsApp itself will never contact you through the app. Also, WhatsApp does not send emails about chats, voice messages, payment, changes, photos, or videos, unless you email their help and support to begin with. Anything offering a free subscription, claiming to be from WhatsApp or encouraging you to follow links in order to safeguard your account is definitely a scam and not to be trusted. WhatsApp offers to users a simple and effective security tips to keep control of your account if your phone is lost or stolen. As well as locking your SIM card through your network provider, WhatsApp recommends that you immediately activate WhatsApp with the same phone number on a different phone, with a replacement SIM. The app can only be used by one number on one device at a time, so by doing so you instantly block it from being used on your old phone. If that’s not possible, WhatsApp can deactivate your account..